Neck pain can be a very debilitating experience, especially if the pain stretches from your neck down into your shoulders. It can prevent you from being able to sit up straight in a chair at work or school, and it can even prevent you from performing everyday tasks around the house. About a third of the population will experience neck pain in any given year, according to the American Physical Therapy Association (APTA.) If untreated, the pain can get worse, and in severe cases, a person might need surgery to correct an injury. However, many people obtain relief from neck pain every year thanks to physical therapy. If you’ve been dealing with neck pain and want to see how physical therapy can help reduce the symptoms, contact Sports & Orthopaedic Therapy Services in Silver Spring, MD today. Injuries: Auto collisions that result in rapidly whipping the head back and forth can lead to whiplash. This is a strain injury on the soft tissues in the neck. Injuries sustained during high-impact sports can also result in neck pain. Muscle Strains: Neck muscles can be strained by overuse. Something as simple as sitting in front of a computer for too many hours with your head bent forward can cause neck strain. Joint Degeneration: The neck joints can erode with age, just like any other joint in the body. Arthritis can also reduce the cartilage between the vertebrae in the neck, causing pain. Illnesses: Certain diseases, such as cancer, meningitis, or rheumatoid arthritis, can lead to neck pain. Physical therapy can be one of the best methods for the treatment of neck pain, according to WebMD. Your physical therapist will work with you during the diagnosis phase to determine the range of motion for your neck and any current limitations due to the pain. You will then work together to come up with an individualized treatment plan to overcome the pain and help you recover as quickly as possible. Your physical therapist will also determine whether certain treatments are more likely to make the condition worse so those can be avoided. Treatments for neck pain will likely include manual therapy, a type of massage designed to reduce stiffness in the neck and improve your range of motion. Your physical therapist will teach you exercises to strengthen and build up the muscles and tissue structures impacted by the neck pain. Treatments might also include the application of ice and heat packs, ultrasound, and electrical stimulation. Your physical therapist will also work with you on improving your posture to help the neck muscles recover and to avoid further re-injury. Whether you’ve been living with neck pain for a while or if you’ve just recently begun to experience it, physical therapy can help you recover more quickly. Contact our office to schedule a consult with a licensed physical therapist today! Physical therapy isn’t normally someones first thought when they have a headache – most of the time, the common reaction is to take some form of pain-relieving medication. This may help to relieve pain in the short-term, but if you are constantly suffering from headaches or migraines, pain relief drugs will not provide you with the same long-term effects that physical therapy will. If you’ve been dealing with pain caused by headaches, contact Sports & Orthopaedic Therapy Services today. Our physical therapist will help you figure out what is causing your headaches and provide an effective, safe, and natural treatment plan for eliminating them! If you are suffering from headaches, contact our Silver Spring physical therapy office today for a consult. At Sports & Orthopaedic Therapy Services, we are dedicated to providing you with the best treatments for your headaches. At your initial appointment, one of our highly trained physical therapists will conduct a physical evaluation and ask you questions about your health history and symptoms, in order to determine what type of headache you are experiencing and where the pain is stemming from. A treatment plan will then be designed specifically for you and your recovery. At Sports & Orthopaedic Therapy Services, our treatments for headaches focus on relieving pain, improving posture and strengthening muscles in the neck and upper back. These will all help in making your daily life much more comfortable and bearable – without the pain of headaches! 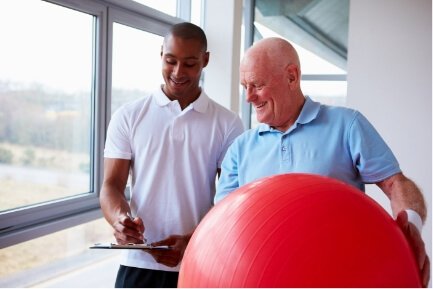 Contact us at Silver Spring, MD center today to speak to one of our Silver Spring physical therapists.